Sometimes thoughts need the right space to happen, the right space to live in. We may choose to distance ourselves from one dimension of our reality to experience another, to have new ideas or gain perspective. At other times, life decides which side of reality we must confront, and so our thinking conforms (or resists). In this moment, I am writing from Washington Square Park. My thoughts are in many places — work, home, past, future — but right now, I’m immersed in the ecosystem of the park. The weather is pleasant, the heat of summer mellowed to a comfortable level — and a signal that fall may not be far. 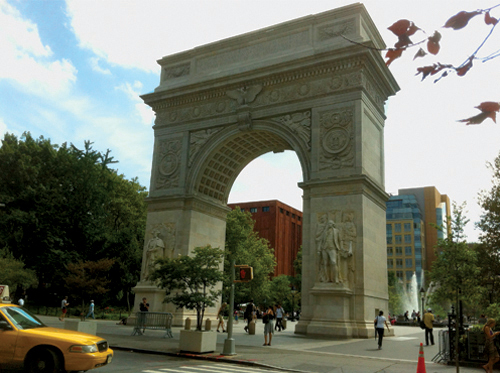 NYU students are back from summer break, or just starting their college experience. Old friends are reconnecting, new friendships are forming. Technology is everywhere: students smiling at text messages, calling family back home, or working deadpan on their laptops, tourists shooting photos or videos of the whole scene, and me, typing this into my iPhone. Jazz music, performed only by a sax player and drummer, sets the perfect backdrop to this afternoon confluence of people and place, a shared sequence of moments in a small but timeless patch of NYC. One moment, hidden among so many parallel realities, struck me this afternoon. As I finished my lunch, out of the corner of my eye I noticed a furry caterpillar begin a perilous journey across a heavily-trafficked walking path leading to the fountain in the center of the park. I looked around and realized I was the only one watching him attempt to cross. Slowly he (or she?) inched forward, arching then flattening his fuzzy brown body. He barely made it three feet, out of the ten feet he needed to cover, before an unsuspecting student clipped his head with his bright white sneaker. In one final arching motion, the caterpillar’s journey ended, and all the while, the scene continued. Friends laughed, dogs walked beside their owners, a breeze flowed through the trees, and the jazz played on. It wasn’t long before he “blended” into the ground, flattened by the waves of footfalls up and down the path. Life goes on, indeed, but it mustn’t go unnoticed. I don’t know the caterpillar’s greater purpose in the grand scheme of things, unless he was destined to become a butterfly and start a butterfly effect. Where did he come from? Where did he think he was going? Why did I just see that? Perhaps I’m reading too much into it and looking for deeper meaning, but I can’t ignore the significance of that moment. I come to this park, as I do other public places, to see my world differently — but really, I come to see the world. In fact, I always see many different worlds, macro and micro, overlapping, colliding, coexisting. In the space of a lunch break, in the space of a public park in NYC, many things can happen if you just tune into the worlds around you.